Fortnite’s V-bucks can be used for an awful lot. You can use them to buy cosmetics within the game, and, er, actually, that’s it. For those of us who enjoy the game living above the law, the in-game currency is only really useful for getting your hands on fancy new skins. For the more legally questionable souls out there, however, V-bucks have taken on a sinister new use. A report by the Independent states that Epic’s currency is being used as a money laundering tool. 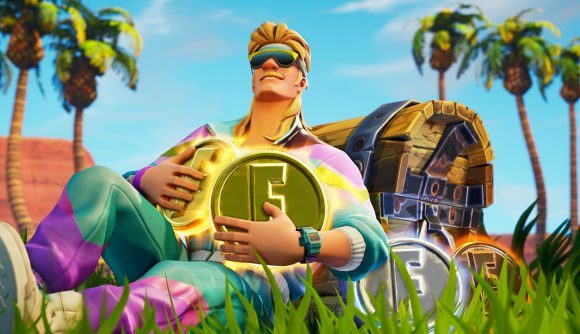 Stolen credit cards are used to purchase the V-bucks, which are then sold back to players at a discounted rate, ‘cleaning’ the money involved in the transaction. The discounted currency is being sold in bulk on the dark web, where Benjamin Preminger, a senior intelligence analyst at cyber security firm SixGill, says “criminals are executing carding fraud and getting money in and out of the Fortnite system with relative impunity.” Smaller quantities of V-bucks are also being sold via various social media platforms, including Instagram and Twitter. Sixgill’s report states that the number of mentions of Fortnite on the dark web has grown in tandem with the game’s monthly revenue, which is thought to have topped $2 billion in 2018 alone. Preminger says that “Epic Games doesn’t seem to clamp down in any serious way on criminal activity surrounding fortnite, money laundering or otherwise.” It’s unclear whether Epic is taking action, but we’ve reached out to the developer in regards to those claims. We will update this story if we hear back.